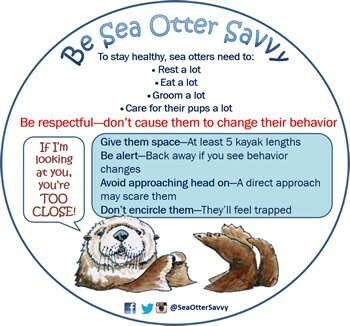 Sea Otter Savvy fosters community awareness and involvement to reduce human-caused disturbance to sea otters and promote responsible wildlife viewing. 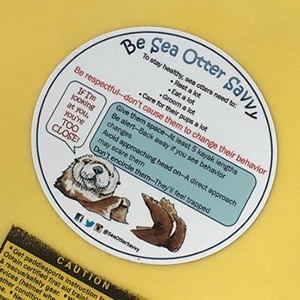 The Sea Otter Savvy program was established in summer of 2015 as a result of collaborative efforts by Southern Sea Otter Alliance members from the Monterey Bay Aquarium, California Department of Fish and Wildlife, Friends of the Sea Otter, and US Fish and Wildlife Service (USFWS). A panel of these advisors meets regularly to discuss strategies and upcoming projects. In January of 2019, we rang in the new year by becoming an official Research Affiliate with our neighbors at the Moss Landing Marine Laboratories! As Southern sea otters recolonize the coastal habitats from which they were nearly extirpated during the maritime rur trade of the 1800s, they are coming increasingly into contact with human activities. In harbors, estuaries, and other sheltered waters of the California coast, the charismatic species is a primary attraction for ecotourists and is also exposed incidentally to other human-related dangers, such as boat traffic and domestic animal interactions. Recent research on the energy expenditures of reproductive female sea otters has shown that individuals in this stage are physiologically challenged, suggesting that repeated disturbance can be harmful to sea otters by depleting their critical energy reserves. In extreme cases, the additional stress caused by human disturbance may lead to pup abandonment or even death. Wildlife tour operators, kayakers, photographers, and other marine recreationists often approach too closely, causing the repeated disturbance of sea otters throughout the day. Without access to information, individuals participating in marine recreation activities may have little understanding of wildlife behavior (such as cues to imminent disturbance), laws protecting marine mammals, or the negative impacts of human-caused disturbance on wildlife. The goal of the Sea Otter Savvy program is to reduce sea otter disturbance by inspiring responsible viewing of wild sea otters. The program will accomplish this goal by engaging and educating the wildlife-viewing public, either directly or indirectly through operators of marine recreation and ecotourism businesses. The program has three objectives: (1) to reduce the frequency of disturbance to sea otters that results from the proximity and behavior of commercial and personal marine recreation and wildlife viewing activities; (2) to minimize the potential for aggressive direct interactions between sea otters, humans, and domestic animals; and (3) to modify the expectation of proximity to sea otters in the minds of potential wildlife viewers to realistically incorporate the spatial needs of sea otters. Create and disseminate outreach content to provide comprehensive information to our target audience in order to create a deeper awareness of sea otter conservation issues. Build a public recognition system for organizations and individuals complying with and promoting disturbance-avoidance techniques and policies. 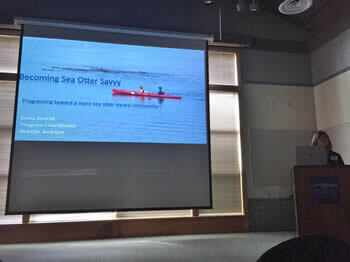 The Sea Otter Savvy program officially launched in August of 2015 and since then have been in the process of researching, developing, and disseminating outreach materials, establishing relationships with stakeholders, giving public presentations, recruiting and training volunteers, and collecting sea otter activity data in three central coast regions. In spring and summer of 2016, we began distributing a waterproof kayak decal with a "Be Sea Otter Savvy" message to kayak rental shops. 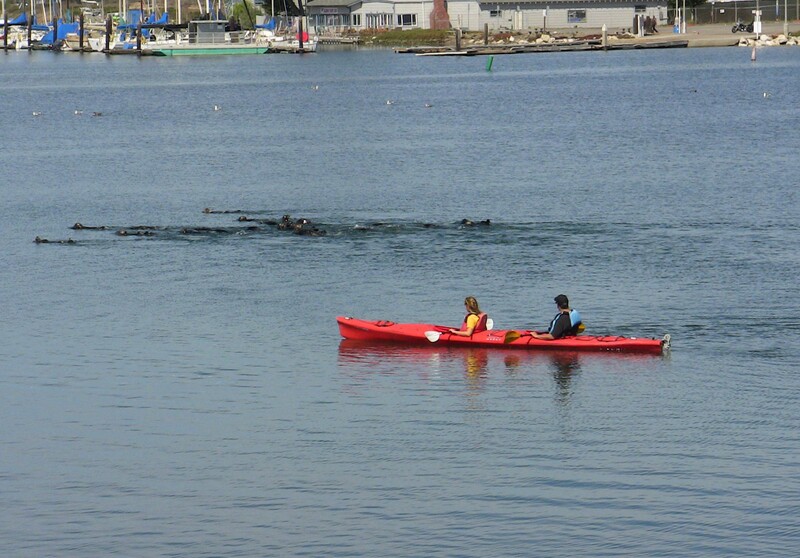 By positioning a sea otter savvy message prominantly within view of kayak and paddleboard paddlers, we hope to to keep them mindful of responsible practices after they paddle away from the beach or dock. Kayak adherent decals Sea Otter Savvy founder, Gena Bentall, giving a public presentation designed to be applied to rental kayaks in a place where they are visible to the paddler. These decals offer simple guidelines to help paddlers avoid disturbance. The decals have been tested in the field and have been proven to stay attached to a typical rental kayak. Instructions for application can be found on our kayak sticker page. Our popular "Respect the nap" stickers that you can request or print yourself! Presentations on sea otters and the importance of respectful sea otter viewing for your staff or as special programs for customers. Invite a sea otter expert to your next event! And of course, Sea Otter Awareness Week! Please contact us by email at for materials and more information.